To honor the lovely folks that #loveindies, here's a collection of Ossuary extras previously only available through the now-defunct IndieGameStand. https://t.co/ovRCaqtO9j Includes compiled dev notes, wallpapers, and the full open-licensed source of the original Flash Narthex. 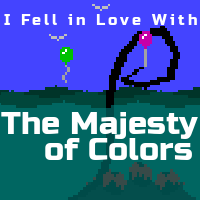 We made "The Majesty of Colors" free on iOS and Android for half the week to encourage folks to play and review the game. It was awesome to see folks' reviews. The Exploit: Zero Day community got in-game currency, free access to a previously restricted short story, and extra friend codes to share with folks. We also uploaded some example Rosette Diceless character sheets from our actual sci-fi themed game. Some of these were games we'd bought a long time ago and never played, and many of them have far too few reviews on Steam. We enjoyed playing all of them and all of them are likely to get more play. Missed #loveindies week and still want to show some support? Leaving reviews for Ossuary and "(I Fell in Love With) The Majesty of Colors" on Steam really helps our visibility. Signing up for the Exploit: Zero Day newsletter gets you access to the free stories in the game, as well as the ability to create and share your own puzzles. We'll be including codes to give to friends in upcoming newsletters—EZD isn't on a platform with a review system, so sharing access through codes while we're still in alpha is a great way to spread the word. Rosette Diceless is coming out on Wednesday, July 25th! If you or people you know are interested in lightweight tabletop and live-action roleplaying systems, share the excerpt on itch.io.